Qin, Ping. 2015. 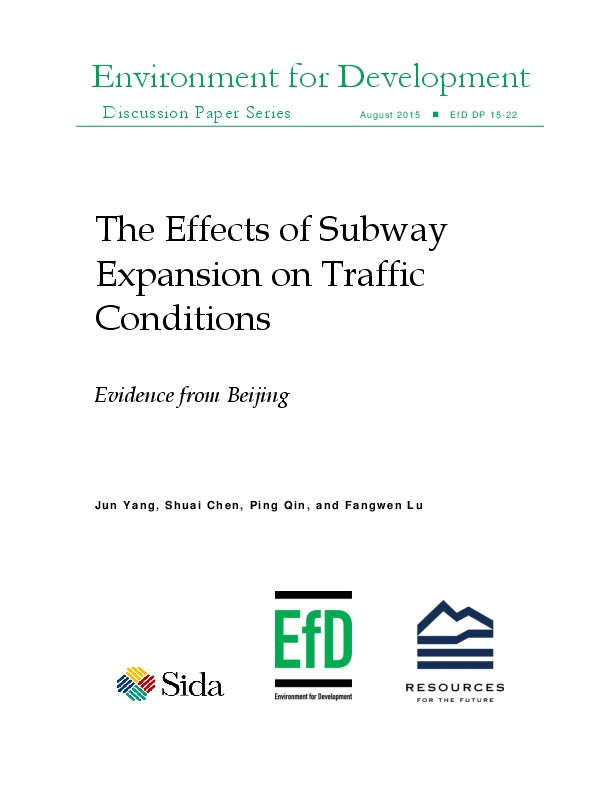 “The Effects of Subway Expansion on Traffic Conditions: Evidence from Beijing.” EfD Discussion Paper Series 15-19. To alleviate traffic congestion, one of the most pressing urban challenges in developing countries, Beijing’s government has been investing increasingly in subway infrastructure. In this study, using fine-scale daily traffic records from 2009 to 2013, we perform a regression discontinuity design to examine the average treatment effects of subway openings on traffic conditions in Beijing from 2009 to 2013. Three findings emerge from our empirical analysis. First, the opening of a new subway line resulted in a significant decline of daily passenger bus ridership, by 452,400 on average. Second, there was a significant positive impact on subway passenger ridership, with an average increase of daily passenger ridership by 246,300 after the opening of each new subway line. Third, we did not find any significant impact of new subway lines opening on the traffic congestion index, indicating that new subway openings have not effectively alleviated the traffic congestion in Beijing. Our results are quite robust to different tests. Our findings imply that subway construction might make it possible that car users give up vehicles and shift to the subway; however, this “pull” strategy alone is not enough to reduce congestion.